Last Saturday at Roundhay, I ran my 300th parkrun. I have run most of my parkruns around the paths of Woodhouse Moor in the heart of Studentville, Leeds. Although I still enjoy the occasional spin around Woodhouse Moor, I’ve transferred my primary allegiance to Roundhay parkrun. The records will show that I was the first finisher at Roundhay on Saturday, a lovely way to remember my 300th parkrun. However, although strictly true, that doesn’t convey fully what actually occurred. My 300th run was announced by the Run Director during the pre-start announcements. 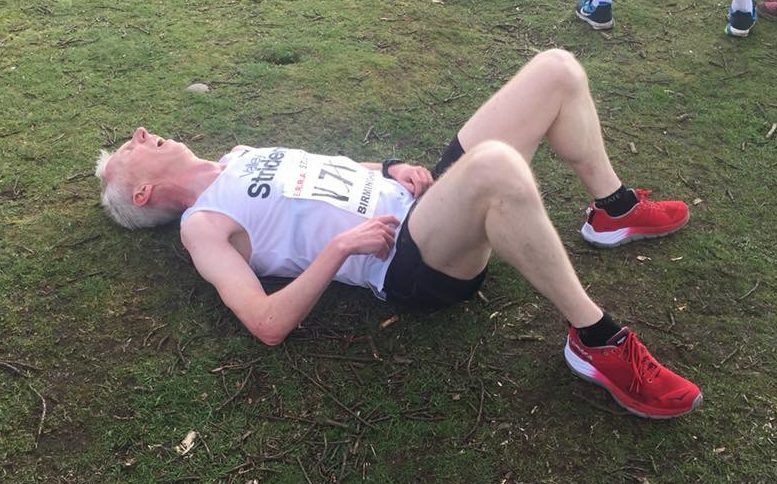 I wanted to give it a real go, so I pushed off hard up the first hill, settling into fourth place, just behind two Abbey Runners. The leader was way off ahead – a talented young athlete whom I know well called Alex Pagdin. Alex is just 18 years old and is already a brilliant track runner with an 800 m personal best of 1:50. Look out for him in the future; I think he might be quite good. I knew I wouldn’t see Alex again during the run. I kept the hammer down and managed to reel in and pass both Abbey guys, so I was in second position. I pushed all the way and crossed the finish line in 18:36, but I was somewhat surprised to be handed the “1” finisher token. Despite finishing well over a minute ahead of me, young Alex had swerved the finish line in order to allow me to be recorded as first finisher. What a remarkably selfless and generous thing to do. Thank you young man; you are a credit to yourself and your parents. I will gladly buy you a beer at the first opportunity! After last Sunday’s half marathon, my legs felt tired this week and I struggled to run a respectable volume of miles. Running was an effort. I shuffled my way half-heartedly through the Tuesday track session. I had intended to do a medium long run on Thursday by adding on miles before and after the Thursday 8 mile group club run. However, after an awful three mile warm-up, I realised that I just wasn’t up for it. I felt deeply fatigued and hungry and although I could have just about dragged myself around the club run, I decided the best course of action would be to sack it off and go home and put my feet up. Sometimes a man needs his rest. On Sunday, along with teammates Myra and Tim, I ventured across to the dark side (i.e. Lancashire) to run my 20 mile pre-marathon tune-up race – the Trimpell 20 in Lancaster. I like to run a 20 mile race about 5 weeks out from a marathon, hoping to run it more or less at target marathon pace. The weather forecast was dismal – torrential rain and 40mph winds. Although there was a very strong gusty breeze and persistent light rain, we were certainly fortunate to miss the worst of the weather on the day. The course was basically flat and consisted of three out and backs along cycleways – a short one, then a slightly longer one around the Trimpell triangle and then a longer one of several miles alongside the swollen River Lune. The finish was back at the castle and the last half mile included a thigh burning spiteful climb up a partly cobbled street. Tim got the better of the traffic in a slightly chaotic start on the narrow cycletracks and surged off in front. As the race settled down, I caught back up and we ran together in a nice comfortable rhythm, knocking out consistent miles a second or three either side of 6:30. Partway into the medium out and back section, a little peloton of about seven runners formed. I think we all realised that it was in our interests to stick together given the wind and knock out a few miles as a group. We chatted and passed drinks around. I could tell Tim was strong and I felt good also. We went through the half marathon point, 13.1 miles in just over 1:25. At this point we were heading eastwards along the River Lune path with the wind on our backs, it felt great. I got a little annoyed with one of the other runners in our group who threw me a dummy at a drinks station, meaning that I completely missed getting a drink. In a bit of a pique, I went to the front and pushed the pace. This fractured the group. I was joined by Tim and a lad from Chester Tri in a mini pack of three. We made the final 180 degree turn; we had 6 miles back into the wind with the nasty climb up to the castle at the end. I knew it was going to be tough. Tim was the strong one, always pushing it at the front. The Chester lad and I were merely hanging on. However, despite running back into the wind, we were somehow maintaining the 6:30 pace. Rather than feeling easy, it was now really hard work. With about three miles to go, the Chester lad fell away, leaving me running a couple of steps behind Tim like a faithful but tired old Spaniel. We hadn’t said anything but I know that we were going to race out the finish; there was a chance that we would be racing for the first MV50 spot. I didn’t fancy my chances, my only hope would be to cling on and try to win in a sprint, though how I would manage to sprint up a steep cobbled street with jelly legs, I had no idea. With under a mile to go, there was a twisty section which included a few swerves around barriers and a run through a pedestrian subway. Tim took a racing line and put in a spurt on the slope out of the subway and took a crucial few metres out of me. Repeating the familiar pattern from recent races, Tim pushed on up the hill to the Castle – finishing in 2:10:30, with me eventually limping in 17 seconds later. We were second and third in our age category as it turned out. Myra ran really well and finished fourth lady in a very good time of 2:21.26. As a marathon tune-up, the race was ideal. I ran 20 miles at 2:50 marathon pace on a windy day without any nutrition during the race and without the benefit of a taper. I’m hoping for a 2:52 something time at London as my A goal in five weeks time. Weight 11 St 0.6 lbs.